I’m a fan of marbles and got this pack for the old fashioned novelty of it, i’m impressed! the tin is nice quality, with a great Normam Rockwell-ish old-timey painting on the front, it’s larger than I thought as well, approx 3.5 x5, It comes with a nice little color/b&w booklet on how to play various games and it’s all made in the USA, can’t beat it. I’ll be buying more from this company again. Great beginner’s set in a nice presentation tin. 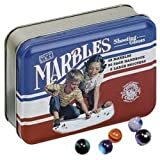 Plus marbles never grow old, don’t need batteries, can be passed down, are fun for boys and girl alike, and any number of people can join in the fun.